I do hate when comedians talk about how they are a minority. I believe it does the opposite of what they are truly aiming for since I just begin to get annoyed and angry at them. Case in point, Roz on last comic standing. There are comedians other than Mitch that do appeal to our generation: Demetri Martin and Daniel Tosh. Ok, I already knew Demetri was great. Just checked out Daniel. Tres Bien. 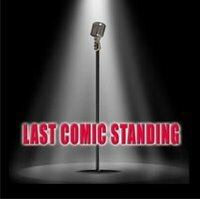 I don't have much to contribute to the topic -- most of the standup I've seen is from Comedy Central specials, most of which seem to have been filmed in the late 1990s (although for some reason I always stop flipping channels when they are showing Lewis Black's Super Bowl halftime show bit). I kind of agree with your take on sarcasm not being suited well to the performance aspect of standup. Sarcasm needs something to react to, which might be why it is more effective on something like "The Daily Show" that can actually show clips. Oh, and thanks for not lumping in Dane Cook. Lisa and I caught the rerun of his SNL hosting job Saturday. Painful, purely painful.